This is a highly stimulating and enjoyable pair of CDs in the collection from naïve "Les Grands Millésimes de NAÏVE CLASSIQUE". It comes in a box box which measures nearly 6" x over 9" and what the advertising material calls a "book" (actually a 72-page booklet in French and English – almost half of which consists of the texts in contemporary and modern French with English translations). The experienced and expert specialists of the five-person ensemble, Alla Francesca, have succeeded remarkably well in bringing the remote twelfth century to life – by emphasizing its very remoteness. Many of what the casual listener assumes are characteristic "sounds" from the period are to be heard on these two CDs… drones, forthright vocal technique, and of course instruments specific to the period such as the hurdy-gurdy, rebec, cittern and a variety of gentle percussion instruments such as finger cymbals, frame drum, tambourine and grelots ("jingles"). Apart from the two purely vocal members of Alla Francesca, Catherine Sergent (on the first CD only) and Raphaël Boulay (the second), each player commands at least half a dozen sometimes unrelated instruments. Pierre Hamon is credited with no fewer than a dozen, as well as his voice. To be sure, there is an air of easy, yet far-reaching and hard-earned, professionalism in the group's approach to the execution of this music which does more than underpin their exciting and original interpretative triumphs. For all the at times alien idioms, this is not an agglomeration of fruity curiosities from a couple of performing generations ago. But a focused, rigorous and highly intelligent exercise in communication. Those are hardly our priorities – at the onset of the second decade of the twenty-first century. Yet Alla Francesca's conception of the music includes foregrounding a universality that makes it easier to relate to. And without sacrificing those aspects of its performance which do not need to be "made relevant". The music is always allowed to go its own way, follow its own logic and succeed by virtue of its own strengths of tempo, structure and ensemble sound in the service of the text. The first CD contains the Miracles de Nostre-Dame, over a dozen individual works by Gautier de Coincy, who was probably born in 1177 and was evidently a writer of texts with the same love of language and its tensile peculiarities (there are puns, word-associations, rhymes and spoonerisms etc) as had Laurence Sterne or James Joyce. Yet Alla Francesca emphasizes less any quirkiness; rather, his conviction and a very suave sense of devotion. The Miracles actually comprise many more than are heard on this hour-long CD. But this selection still makes a compelling – and truly enthralling – one. 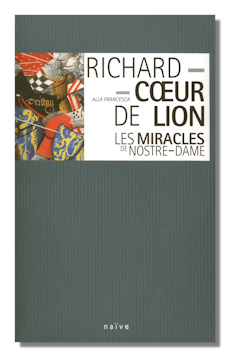 The second CD celebrates the time and contributions made by the English monarch, Richard Plantagenet (1147-1199), "The Lionheart". More than a patron, Richard was writing poetry and music at the height of the troubadour movement. Works by Richard himself and half a dozen or so of those working in the same tradition make listening that is just as compelling and varied, and with just as much beauty and subtlety. The subject matter embraces wider concerns than those of the Miracles. They include the Crusades, (political) satire and secular ("courtly") love. There is a remarkably broad range of forms… sirventès, canso, pastourelle, lai, and rotrouenge etc. The short (given the rest of the packaging) essay that covers the music on the second CD gives brief background on most of these. As with the de Coincy, there are other collections (notably by Gothic voices) of this music. None – almost by definition; certain in practice – can be definitive or comprehensive: there are just too many works to gather all together. But this is a varied and nevertheless quite cohesive (certainly utterly enchanting) selection which makes more than an adequate introduction to the genre – so accomplished and insightful are the technique and imagination of Alla Francesca. It's hard, then, to praise the performances of Alla Francesca too highly: precision, passion, clarity, communicativeness and all round persuasiveness are their characteristics. The acoustics are appropriately resonant. That these are actually repackaged recordings from over ten years ago (as is the case with this Collection from naïve in general) must not detract from the impact of wonderful music wonderfully sung. Recommended. Copyright © 2010, Mark Sealey.